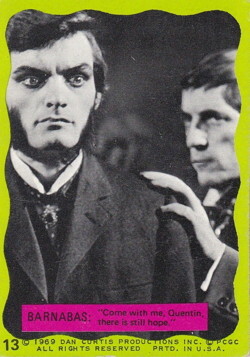 Against all odds, it’s still the summer of 1969, and Dark Shadows has never been more popular. Eccentric millionaire Barnabas Collins has transported himself back in time to 1897, where he discovers that today’s teen dream Quentin C. is a restless, shambling zombie. Young Jamison is possessed by the spirit of Quentin, or possibly the other way around; it’s difficult to tell. To save the family, Reverend Trask tries to perform an exorcism, and then a gypsy tells Quentin’s fortune. Meanwhile, Mad Jenny finds a set of keys, while somewhere a werewolf must hurry, for darkness means death. And that about brings us up to date. Naturally, this isn’t the Dark Shadows that we know from ABC-TV’s afternoon lineup. 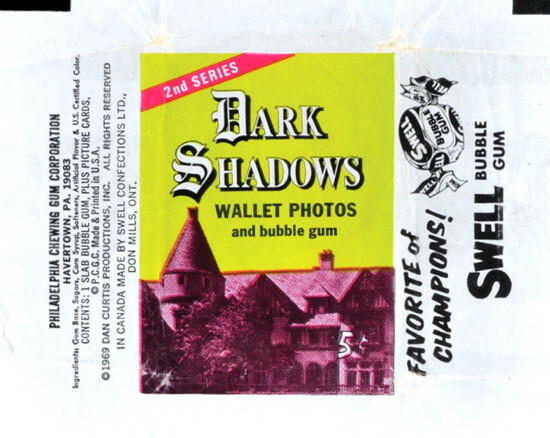 I’m talking about the two-dimensional Dark Shadows, which has been renewed for a second season by the Philadelphia Chewing Gum Corporation. They released the first set of DS trading cards last year, and now they’ve got a fresh new take on the soap sensation. 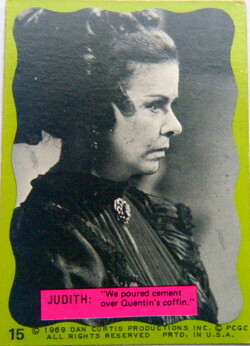 The red gum cards, as you’ll recall, were mostly portraits of the stars. Lots of Barnabas, of course, with some attention paid to Angelique, Julia, Elizabeth, Nicholas Blair and Adam. 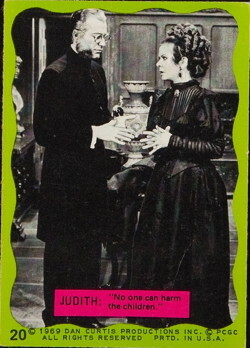 There was a little run of cards in the middle that were action shots from Barnabas’ trip to the cemetery with Maggie, but mostly it was just characters facing front and trying to look recognizable on a two-inch strip of cardboard. They were fetish items, really, a set of sixty-six magic talismen, which the young set could keep close to their hearts, and remember the glory days of the Nicholas/Adam storyline. But the remembering part was all client-side; the cards’ contribution was just context-free reminders of what the players looked like, once upon a time. But the green gum cards take a different, more ambitious route. These cards tell a story, kind of, in sixty-six bite-size chunks. Each card has a line of dialogue, and when you put the whole set together, it forms a vaguely recognizable sequence of events. As your collection grows, each five-card pack gives you the opportunity to fill in the gaps in your episode guide. So what you get, ultimately, is an extremely loose paraphrase of the early 1897 storyline, with an emphasis on the Zombie Quentin story from episodes 723 to 726 in April. 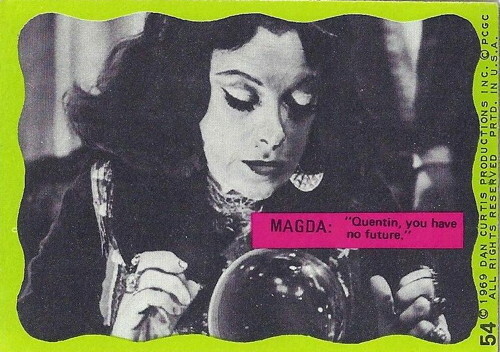 After that, there’s a detour back to March, with Magda telling Quentin’s fortune and Mad Jenny percolating in the basement. 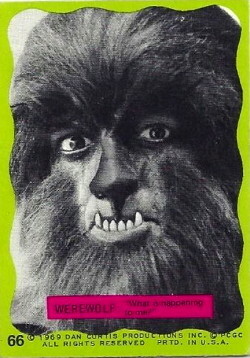 The series concludes with a brief introduction to an unusually well-spoken werewolf. 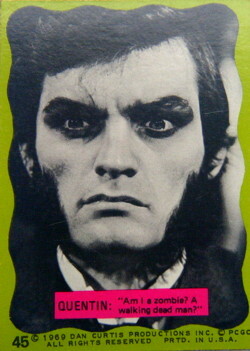 Obviously, this is the best Dark Shadows merchandise ever made. It ticks all the boxes — anxious, baffling and impossible, mixing thrilling action moments with moody introspection and dialogue that hardly matters, distributed to the public at random and in the wrong order. 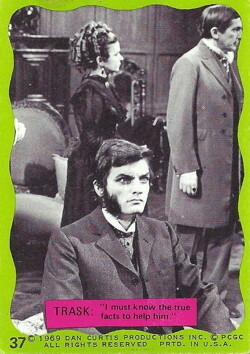 If we have to keep rebooting Dark Shadows, and according to some people we do, then the only acceptable format is trading cards. Sorry, comic books and full-cast audio dramas — you’re very nice, but honestly, what do you bring to the table? I’ve bought a whole bunch of you, and in all that time, have you ever delivered even a single stick of gum? Admittedly, the medium is a little challenging, because we’re trying to depict a fairly complex moment in the storyline, and all we’ve got is a still picture and a brief line of dialogue — generally around six words, nine at the absolute max. This is what a Dark Shadows episode would be like if it were performed entirely on Twitter. The series begins with a six-card introductory thinks monologue by Barnabas, as he adopts various thoughtful poses. Seriously, that’s the caption. “We are dealing with a pagan thing.” We’re only up to card #2 so far. “I have lived long, I doubt nothing,” Barnabas muses, cryptically. And then he offers, “I have no answer to this terrible thing,” which would actually make a pretty good slogan for Dan Curtis Productions. And then we’re in the past! There aren’t a lot of establishing shots in this story; you have to just take it on faith that we’re someplace else. Transitions, says the Philadelphia Chewing Gum Corporation, are for the weak. So it’s time for an upsetting heart-to-heart with Judith. 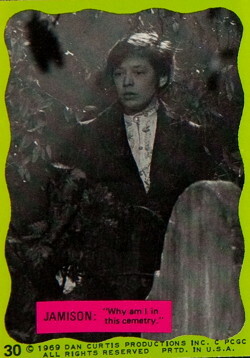 “Go to Quentin’s grave, see for yourself,” Barnabas tells her. 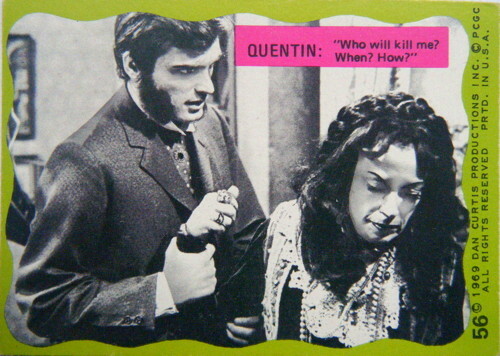 Judith asks, “When will Quentin rise again?” and Barnabas replies, “Quentin may yet live again.” This doesn’t seem to be much of a comfort. 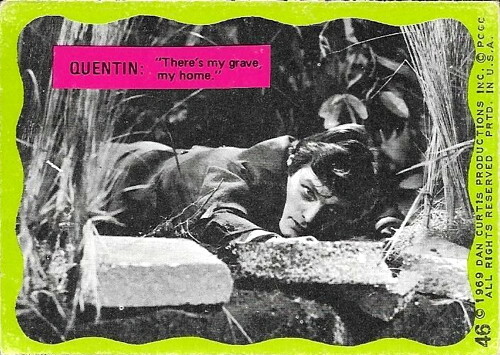 It’s also hard on the young set — we’re only buying this set to get some nice pictures of Quentin, and apparently he’s already dead and buried. Kind of a downer. “Good evening, I’m Gregory Trask,” says a new visitor, beginning a fairly disappointing run of Trask-centered cards. I don’t have the power to read the minds of children in 1969, and I’m not sure what I would do with that power if I had it, but I’m pretty sure when they shelled out five cents in American cash money, they weren’t looking for a handful of identical Trask and Judith shots. To add insult to injury, the dialogue starts to run in circles. “We must protect the children from evil,” Trask says, and Judith agrees, “No one can harm the children.” I’d expect these two cards are difficult to find these days, because the children of ’69 would tear them up in digust, and scatter the pieces to the winds. They were a passionate and dramatic people, the young set of the sixties. They allow Barnabas back into the picture for a moment, although he doesn’t have much to contribute. 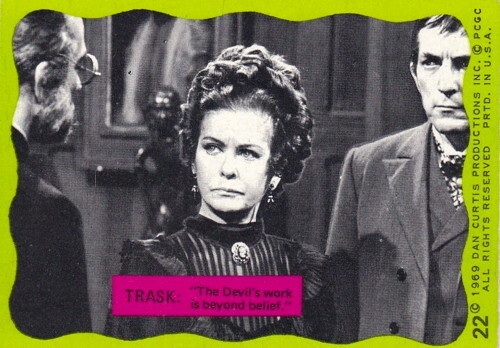 Judith says, “But I saw them bury him myself,” and Trask adds, “The devil’s work is beyond belief.” Barnabas just kind of stays in the background and fumes. “Last year, I had practically an entire trading card set to myself,” he mutters, off-camera. 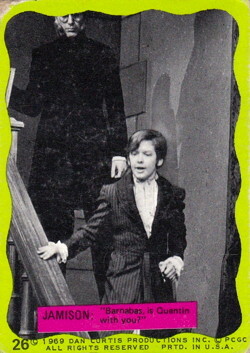 And then in the next card, Jamison is coming downstairs, saying, “Barnabas, is Quentin with you?” That’s how we know this is a Dark Shadows card set, it has continuity errors. Then Trask takes the reins for a few more lines. “I can sense an alien spirit here,” he says, and observes, “A dead body that once was a man.” This story’s going great so far, if you’re a fan of Quentin glaring off into space. I hope you’re enjoying this, by the way, because this is all we’re doing today, just roaming the halls of trading-card Collinwood. Suddenly, Jamison is across town, which surprises him just as much as anybody. His take on the situation: “Why am I in this cemetry.” There’s no question mark, and cemetery is spelled wrong, so that ups the tension level, if you’re a stickler about such things. Then he’s kneeling by a body, saying, “I’m not Jamison, my name is Quentin.” It’s not clear who he’s addressing at the moment; the Philadelphia Chewing Gum Corporation has chosen not to share that intel. “His hand is so cold,” the boy says, which if that’s a problem, he probably shouldn’t go around fondling corpses. But you can’t keep trading-card Jamison down for long. “I want him to live again,” he says, and then calls, “Spirit, depart from this body.” I’m pretty sure the spirit has already departed, that’s why he’s lying on the pavement, but whatever. Back at Collinwood and apropos of nothing in particular, there’s a shot of Barnabas’ portrait, as he says, “I’m thinking of Barnabas Collins and when he lived.” I have nothing to offer, you’re on your own for that one. But we can’t just sit around the trading-card drawing room; that’s no way to sell chewing gum. An impatient Jamison asks, “What is he going to do?” and then Trask announces, “This boy is possessed by a giant evil force.” And that concludes the Trask-heavy portion of today’s feature. Now it’s time for Quentin to be an active participant in the process, and he comes through with a monologue that I find utterly head-baffling. I’ll die when the moon is full. My spirit is in Jamison’s body. What strange power guides my life? Perhaps Barnabas knows the answer. Am I a zombie? A walking dead man? There’s my grave, my home. 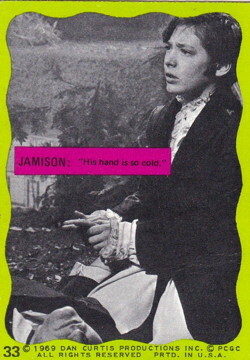 Jamison, come to me, help me. It’s too late, my life is slipping away. The thing that I really like about this trading card set is how willfully contrary it is. In some places, they’re acting like it’s crucial that these cards tell a story, all the way down to introducing a scene with a card that says, “Good evening, I’m Gregory Trask.” But then they do an eight-card paradoxical soliloquy where it’s just not clear what they’re going for. I mean, when you get right down to it, what strange power guides my life? You know what I mean? 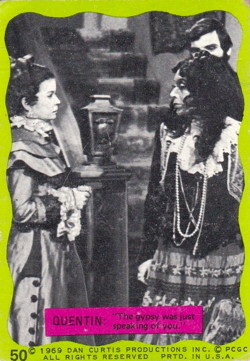 They’re really hung up on Judith for some reason; she’s in more cards than Barnabas is. The only character who beats Judith’s record is Quentin, and he has to die and come back to life in order to do it. So Judith has to sprint up to Quentin’s room for the next scene, crying, “That music will drive me mad!” She’s been running and up and down the stairs for the last five cards; she must be exhausted. 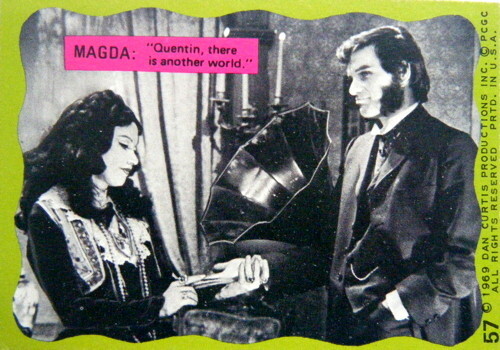 Magda’s non-reassuring response is, “Quentin, there is another world,” as he hands over some cash. “This will help you see my future better,” he says, and that’s a wrap for the crystal ball scene. This all leads up to what I think is probably the high point of the entire trading card line, a close-up of Jenny clutching a dagger. Thou shalt not worship false eyelashes, they say, but how can you not. We finish up with a mysterious little coda of four werewolf cards, including internal werewolf dialogue. “I must hurry, dawn means death,” the werewolf gasps. Again, not super sure what that means, but it’s the first six words he’s ever said, so cut him some slack. Then Carolyn appears, screaming, “Oh, please won’t someone save me?” but it’s not clear if anyone ever does. It’s an inconclusive ending, really, but what do you expect for five cents, a car chase? The following is another article written by Alan James Gallant, continuing the article posted as an extra on my previous trading cards post. This was written for the website Dark Shadows Journal, but DSJ has become The Dark Shadows News Page, and Alan’s article isn’t live on the site anymore. He suggested reposting it here, which I’m happy to do, because it is wonderful. 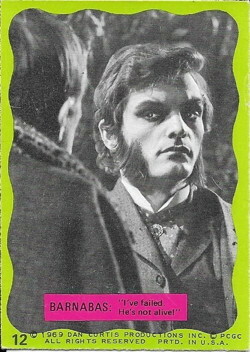 The “2nd Series” of cards, as their wrapper proclaimed, was issued in the summer of 1969, capitalising on the tremendous popularity of the then current 1897 storyline and the newest Dark Shadows star, David Selby as Quentin Collins. 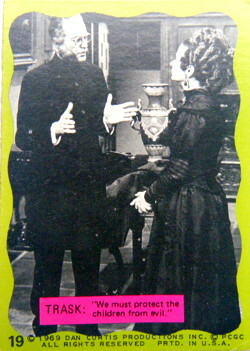 The 66 cards in the series covered the earlier period of 1897, once again composed of black-and-white publicity stills, generally taken during dress rehearsals on the set. The cards had a wavy green border which was probably intended to resemble a picture frame. 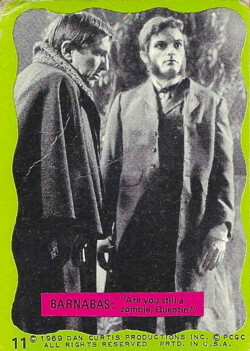 There were no autograph facsimiles on the individual cards of the set, but there were small purple dialogue boxes which were usually directly above the bottom green border, over the still itself. In a few cases, the box would find its way to the top or centre of the photo. Each of these had a simple sentence, in black lettering, explaining the scene on the card. The sentences were presented as attribute character quotes. The story was somewhat stilted when put together, but any young fan of the show could tell exactly what was happening. 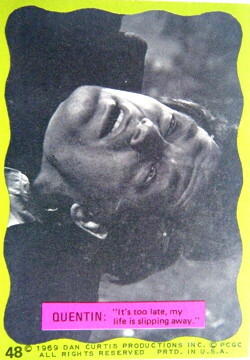 On the bottom section of the wavy green border, from left to right, appeared the assigned card number and “1969 DAN CURTIS PRODUCTIONS INC. PCGC ALL RIGHTS RESERVED PRTD. 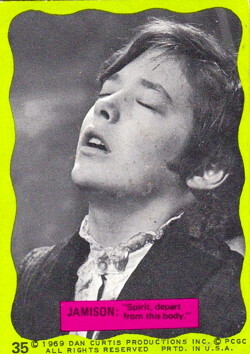 IN U.S.A.”, as seen on series one. The backs of the 66 cards of the set formed four different black-and-white “pin-up” photos, each with a green facsimile autograph in the lower right corner. These were Barnabas (foyer painting), Angelique (as seen on pink card 38), Quentin Collins (as seen on green card 43), and Chris Jennings (werewolf, as seen on green card 66). 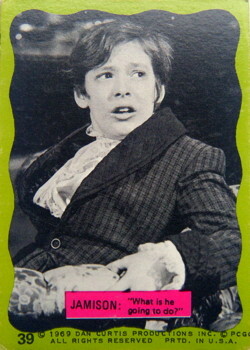 The packaging reflected the style of the cards, with a wrapper depicting Collinwood on the lower edge of its centre panel, a sepia photo set in a green background and a purple strip in the upper left hand corner proclaiming “2nd Series” in white letters. A white version of the series logo dominated the upper centre of the front of the gum pack. Beneath these words were the smaller, plain black words “WALLET PHOTOS AND BUBBLE GUM”. In the lower right corner “5¢” was announced in green. The white borders of the wrapper contained at least two different ads, these appearing to the right of the center panel. They were ads for SWELL bubble gum (Favorite of Champions!) 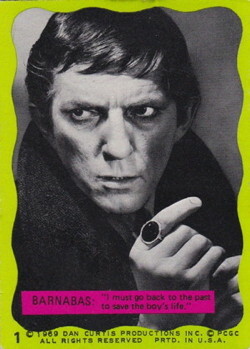 , and the famous Barnabas Ring ad, complete with drawings of the ring and the vampire. These wrappers held 5 random cards and a single stick of bubble gum. 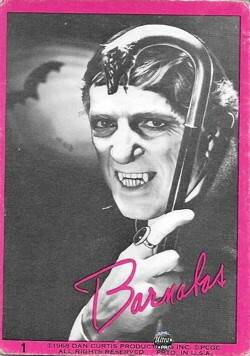 The Barnabas ring was a tie-in promotion with the cards that became one of the rarest and sought-after Dark Shadows collectables. For 50c and five gum wrappers, fans could obtain a cheap replica of the ring Barnabas wore on the show by mail order from Timco Industries. Because so few survived, they have recently commanded prices of over $1000.00 from collectors. In 1998, MPI Home Video produced a licensed replica of the ring. The packs came in boxes of 24, with the display box similar in style to the packs. 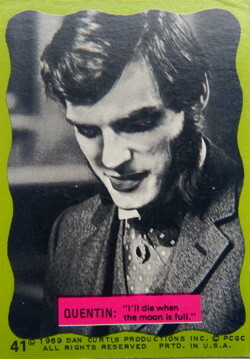 The top of the box shows the same green and purple color scheme, with the Dark Shadows logo in white in the upper right section of the box top. Above and to the left of this was a small pink rectangle with the words “SECOND SERIES” in white letters. 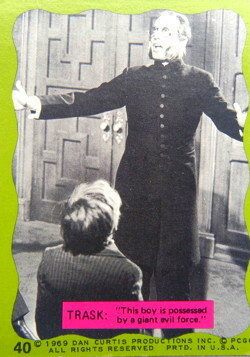 Farther left was a sepia-hued photo of Barnabas (a mirror image of pink card 1), with his cane. Left of that was the “Swell” insignia and the words “© 1969 Dan Curtis Prod., Inc. All Rights Reserved.” The price, “5¢,” in white, was far right. The sepia-toned Collinwood stretched across the box top, from left centre to right. The front side of the box also had the image of Collinwood, this time to the left. The upper center area of this panel was where the series logo was, with the “WALLET PHOTOS and BUBBLE GUM” and “5¢” in black below the right section of the series logo. 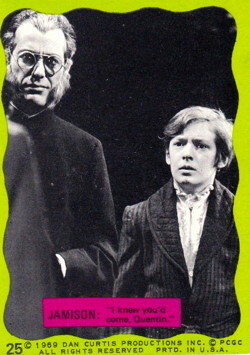 A picture of Barnabas (from the pink series wrapper) was to the far right. The second series focuses on plotline rather than the character portraits of the first series. 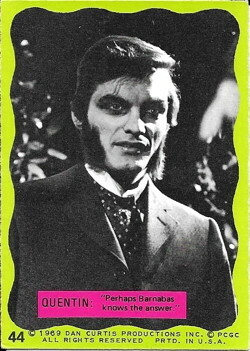 The bulk of the cards feature the 1897 storyline involving Quentin as a zombie. This story began with episode 722 (aired on April 1 1969; taped on March 25 1969), when Quentin is re-animated, concluding with the arrival of Gregory Trask and his “curing” of both Quentin and the possessed Jamison in episode 726 (aired on April 7 1969; taped on March 31 1969). Cards 7-48 deal with this story. Interestingly, Trask wears glasses in the shots on the cards; by tape time, the decision was made to not use the spectacles. The same frames had appeared earlier, as the Eagle Hill cemetery caretaker’s, in 1967. 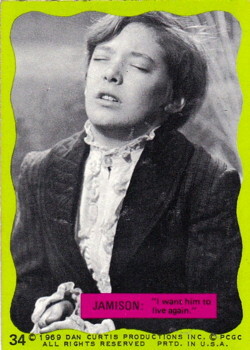 The first six cards depict Barnabas, with dialogue such as: “I must go back to the past to save the boy’s life,” and “Why is the ghost possessing Jamison?”, beginning the main story. 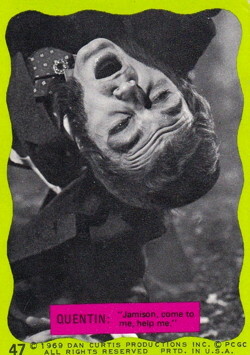 Card 1 is one of the “bat against red moon” series taken in 1967. Cards 2-4 appear to be taken during rehearsal for episode 725 (taped March 28 1969, aired April 4 1969). 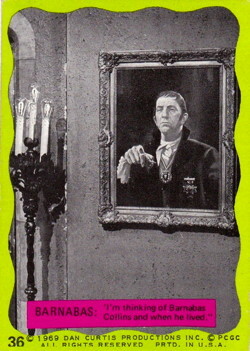 A color version of card 5 can be found on the back cover of Barnabas Collins: A Personal Picture Album, with Jonathan Frid’s autograph, taken on the stairway in the Old House. 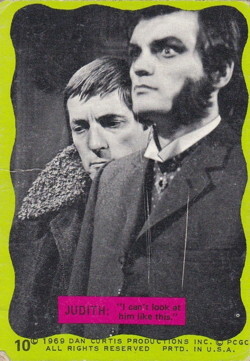 Interestingly, the publicity still on card 6 is the only series shot not done on the set during dress rehearsals. 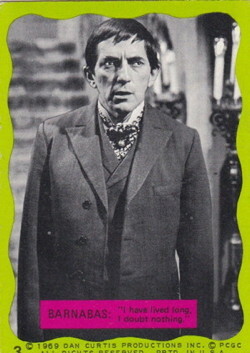 This is a location shot of Barnabas inside a mansion, standing on a staircase with a heavy coat and a large book in his right hand. Another picture from this shoot can be seen on the cover of MPI Home Video’s The Best of Barnabas video. He is in modern dress, as in cards 1 and 5. After general angst and disbelief in cards 7-48 (all shot during dress rehearsal for episode 725, with the exception of card 14, taken during 719), cards 49-62 take place at various times before Quentin’s murder by “Crazy Jenny” and his subsequent revival as a zombie. Cards 49-58 take place during episode 719 (aired March 27 1969; taped March 20 1969). 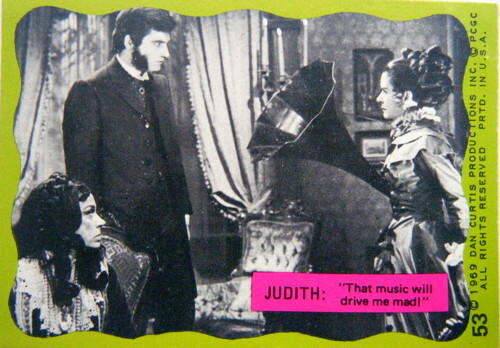 Card 49 has a direct quote from the episode, in Judith’s declaration, “That music is driving me mad!”. 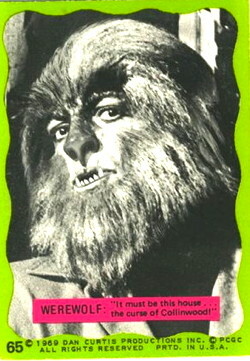 The series had a maddening habit of quoting faithfully at times, then inserting absurd quotes, such as those attributed to the unthinking zombie Quentin: “I’ll die when the moon is full!” Also, at the series end, the werewolf has coherent thought, a la the Gold Key Comics: “I must hurry, dawn means death!” The remainder of the cards through to 58 focus on Magda telling Quentin’s fortune, with Quentin and Judith arguing. 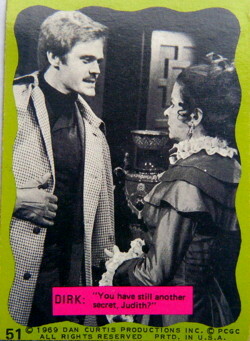 A brief sidelight is explored in cards 51 and 52, involving Dirk and Judith discussing Judith’s secret—Jenny Collins. Cards 59 and 60 deal with “Mad Jenny” interacting with Dirk and Judith. Card 61 shows her happily looking at the keys to her prison-room, taken from Dirk after knocking him out cold. All of these shots also originate from episode 719. 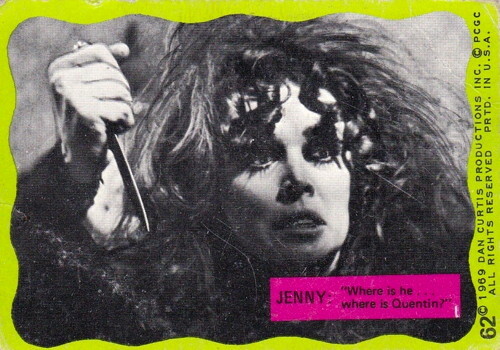 Card 62 seems to be from the same episode, showing Jenny brandishing a knife. Then, suddenly, we are whisked away from the gaslight of 1897 to 1969. 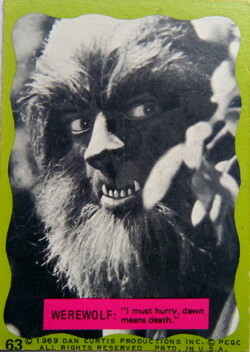 Cards 63-66, are from this era, depicting the werewolf. 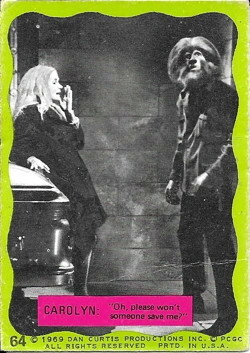 Card 64, in particular, shows the werewolf and Carolyn in Elizabeth’s mausoleum during dress rehearsal for episode 672 (aired on January 20 1969; taped on January 13 1969). Card 64 is one of the unique cards in the series, betraying the manner in which the stills were procured. Several of the stars have discussed the introduction of a photographer into the rehearsal process, with some resentment. 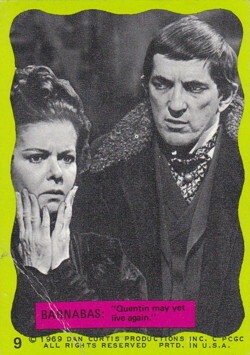 In an interview which appeared in Craig Hamrick’s Dark Shadows Collector’s Guide, Kathryn Leigh Scott explained: “We would actually come on the set with our hair in curlers or an old bathrobe on,” apparently in rebellion against having no say in the merchandising or photo selection. In 64, we see Carolyn screaming in terror, as Alex Stevens half-heartedly stares off toward the camera, with no hand make-up! On cards 32, 33, 43, 46, and 48, Quentin is missing his mutton chops! One can only imagine the more obvious examples of unusable stills, bathrobes and all! Actually, one has only to go to the Imagine 1993 card set to see what this would have been like. 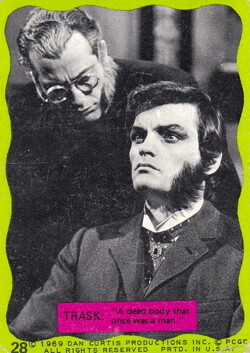 Card 54 of that series shows Scott and Don Briscoe in a scene depicting Rachel Drummond’s mortal wounding in episode 776 (aired on June 16 1969; taped on June 9, 1969). In this still, Scott is indeed in bathrobe and curlers. According to Jeff and Bob Marks, in their article about Philadelphia Gum in The Wrapper, the folks at Swell gum sent a photographer over to take shots for the card series, augmented with existing stills from Dan Curtis Productions. For the second series, it seems the photographer recorded two different taping dates: Thursday March 20 (episode 719), and Friday March 28 (episode 725) 1969. 59 of the cards bear images from these two production dates; 44 from 725 and 15 from 719. 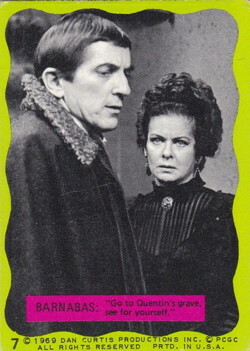 Interestingly, several characters key to the early storyline depicted on these cards, along with actors who appeared in the episodes the photos were taken during, were absent from the card set. 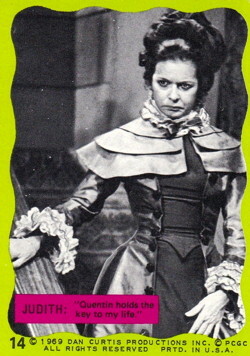 Angelique, who caused Quentin to become a zombie, was not included, her puzzle-back picture taken from a 1795 photograph. Rachel Drummond is nowhere to be seen. The simpering Carl Collins, who is there when the dead Quentin is re-animated as a zombie, is absent. Sandor, with his rescue of Rachel from the undead Quentin, would have lent some more action to the story. But, all things considered, including some flawed captions and blurry touch-ups, the second series is a fun and interesting glimpse of the early goings-on at 1897 Collinwood. Amanda asks Tim, “Why don’t you go to the police and tell them how Evans and Trask tricked you?” She means Evan. When Petofi and Tate are in the Inn’s lobby waiting for Amanda to come downstairs, a shadow on the back wall indicates that she’s standing there, waiting for her cue. I’ve never owned these (my cards were Star Wars) but to recreate the exhilaration of buying an actual pack I went to a random number site and had it pick five numbers from 1 to 66, and that was my pack (when a number was missing from this post I went to the next highest card number). My imaginary pack includes cards 12, 14, 19, 37 and 53. Score: Judith 4. Quentin 3. Barnabas 2. Trask 1. Magda 1. 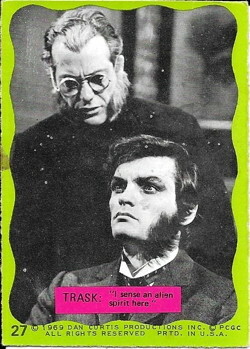 I don’t remember Trask wearing glasses in those scenes. Perhaps these are outtake images or shots from dress rehearsals — especially that one of Carolyn and the werewolf, where the werewolf stands there looking off camera with a thoughtful expression as though assimilating instructions from the director. Therefore, a highly valuable set of cards, with images not of the show as we have been viewing it, but of dress rehearsals and therefore rare, seldom seen photos. In fact, I’d like to see the dress rehearsals from each and every episode released on DVD as a special bonus box set — just think of all those additional bloopers that never made it to final taping. Maybe if we write to MPI we can create a demand. It could be called… The Making of Collinwood. Trask’s glasses did not make it past the rehearsal stage of his first episode, as you pretty much guessed. The ABC photographer caught the experiment before the glasses were shelved. I’ve never owned any either, but this kind of thing is always interesting. Of course, before home video things like this and “fumetti” type magazines were the closest thing to owning a show or movie (unless you managed to actually own the things on film). My favorite example is the books of a writer named Richard Anobile, who recreated a great number of movies in book form that way. I had these cards as a kid and loved them. 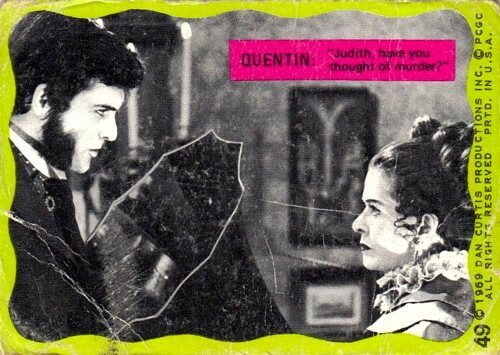 But card 48 always creeped me out because I didn’t think it was Quentin, and seeing it again all these years later, I’m still not sure it is. Look at it closely. No muttonchops. Almost looks like Roger Davis. And then the Carolyn card confused the hell out of me. I’d started watching the show in 1897 and wasn’t aware there was any other time period. What’s Carolyn doing in this series anyway?? The stick of gum that came with these cards was much better-tasting than the gum that came with “The Green Hornet” TV bubble gum cards in circulation about the same time. 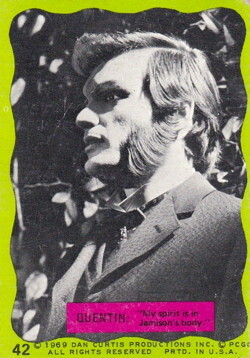 That’s probably why The Green Hornet got canceled after 1 season but Dark Shadows stayed on the air until 1971.